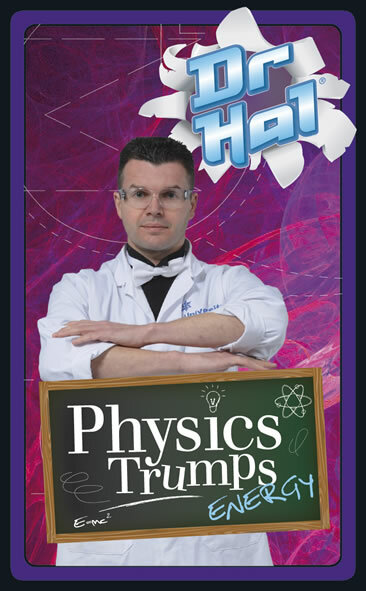 Dr Hal's Physics Trumps is a trump-style game based on physics phenomena with a sub-topic of energy. 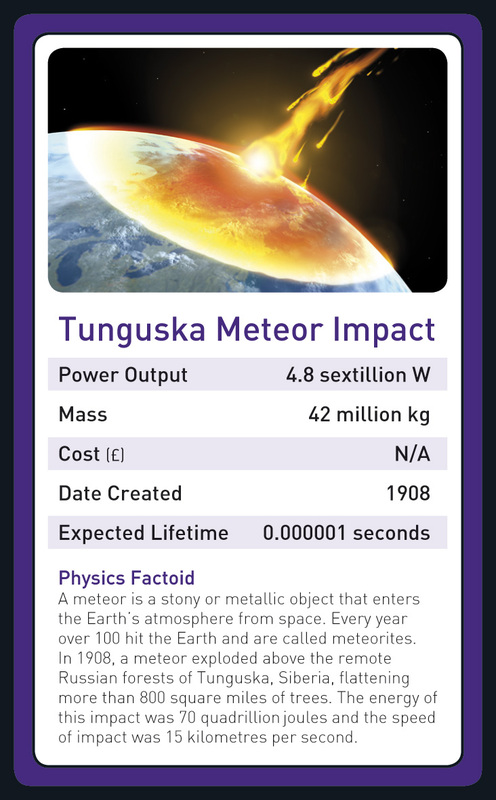 The game is designed to facilitate physics discourse between players and apply the physics principles of mass, energy (power) and speed to both human-made and natural physics phenomena. The game is suitable from Key Stage 3 and above, up to A Level. It is an ideal learning tool and aid to revision and study. 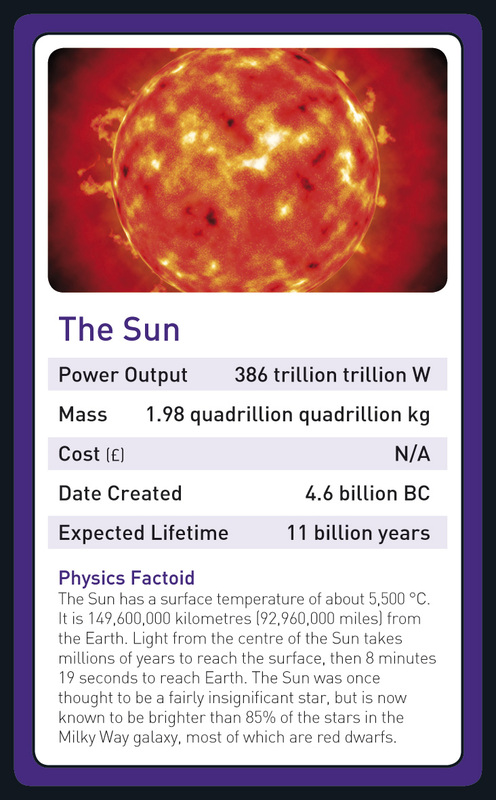 There are many learning outcomes from playing the game, one of which is grasping the huge spectrum in number values and some understanding of Standard Index Form, for example by comparing the mass of the sun with an electron. Masses are expressed in kg and energy in Watts but also where appropriate with SI prefixes denoting milli-, micro-, nano-, pico-, mega-, giga-, terra-, peta-. There is also a key to all the SI unit prefixes on the back of the title card. These items are normally taught at Key Stage 4 (age 14) but the game can be played at Key Stage 3 (age 11) without difficulty. 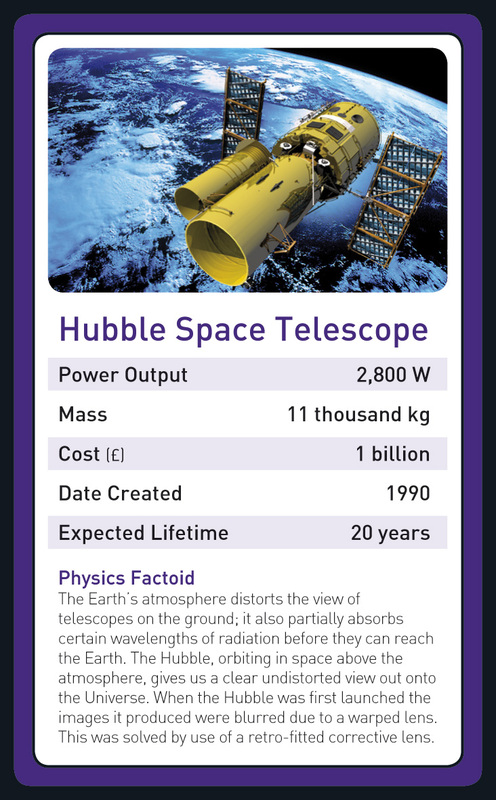 The cards were researched by Steven Kilgallon, a Physics Educational and Technology Facilitator within the Creativity Centre of a leading UK University. The research was overseen by Dr Stuart Ansell, Research Physicist at the Rutherford Appleton Laboratory, Didcot UK. Teacher's/Learning notes are downloadable to accompany the game and reinforce the learning outcomes. 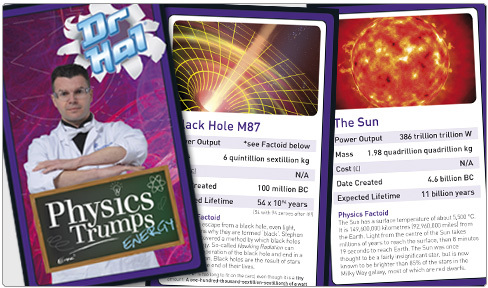 At the foot of each cards are some physics factoids which provide novel takeaway knowledge from the game and promote discourse and discussion.